The University of Johannesburg (UJ) is embarking on a project to develop a broad multi-disciplinary suite of training programmes to fortify implementation of green economy from a research and piloting perspective. The strengthening of innovation coupled with skills development, could translate into sustainable job creation within the energy and water sector over the next decade.The ground-breaking training programmes envisaged as a starting point are a vital investment into the renewable energy sector and highlights the significant role higher education plays in implementing these green economy targets as prioritized in the New Growth Path driven by Economic Development Minister, Ebrahim Patel. The training programmes came to fruition with the recent signing of a Memorandum of Understanding (MoU) between the University’s Faculty of Engineering and the Built Environment and the Energy and Water Sector Education and Training Authority (EWSETA), one of the 23 Sector Education & Training Authorities (SETAs) established in South Africa to develop skills. Mr Errol Gradwell, Chief Executive Officer of EWSETA, drew attention to the fact that EWSETA is accredited by the South African Qualifications Authority (SAQA) to perform all sector-specific quality assurance functions, including provider (public and private) accreditation, qualifications development, assessor registration and certification of learners and students. “As such, we coordinate, facilitate and ensure quality skills development programmes for our stakeholders in the energy and water sector in line with national skills development priorities as dictated by the National Skills Development Strategy (NSDS III)”. 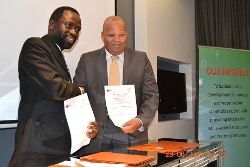 “This MoU will support collaboration with respect to training and research activities and is an indication that we are committed to the industry,” says UJ’s Professor Tshilidzi Marwala, Deputy Vice-Chancellor of Research, Postgraduate Studies and the Library. “The partnership provides UJ with the opportunity of being involved in real and major industry projects that will provide substantial change away from the country’s coal-based energy mix.” He added that the University, with a student composite of close to 50 000 and an Engineering Faculty of more than 8 000 students across 10 disciplines and a dedicated Centre of Excellence in Renewable Energy and Environment, is perfectly positioned to plug into and create the skills backbone. The Centre also houses PEETS, a process, energy and environmental technology station. PEETS, through this agreement, will facilitate the acceleration of the development of a skills base for the renewable energy industry across the country. The stimulation of scientific awareness, in the relevance of renewable energies in South African and the growth of the green economy, finds strong focus within UJ. The agreement between UJ and EWSETA is indeed a milestone in realizing the design of a training blueprint for the proliferation of short courses, accredited learning programmes and sector-specific research within the energy and water sector. The University is already in the programme design phase with the focus on renewable energy curricula at undergraduate and postgraduate levels and producing outputs-based research towards this project. Central to the objectives of the NSDS III, says Gradwell, is the placement of students and graduates especially from Further Education and Training Colleges (FETCs), Universities and Universities of Technology. “EWSETA has entered into a number of partnership agreements with these institutions (nationally and internationally) as well as industry to secure the platforms for greater collaboration and success. The MoU with UJ is unique not only because it has the largest engineering faculty in the country, but also due to the centrality of UJ in the establishing of the University of the Northern Cape, a province where the Northern Cape Solar Corridor is envisaged. This is a project where EWSETA is investing more than R100m to drive its focus on renewable energy. UJ is playing a key in making the project a success”. Prof Marwala concludes: “With alternative and sustainable sources of energy high on the country’s agenda, this agreement is investing in the nation’s development as this will translate our advances into gains for the country”. IMAGE:Professor Tshilidzi Marwala, Deputy Vice-Chancellor of Research, Postgraduate Studies and the Library at the University of Johannesburg and Mr Errol Gradwell, Chief Executive Officer of the Energy and Water Sector Education and Training Authority.